Aggregate sites that compile and share written content have been around the web for a while now, but there’s one site on the scene that seeks to make the process much more relevant, engaging and useful. By creating a personalised experience for each user and putting them in touch with information that is directly relevant to them, Quora makes it easier than ever to find and share quality web content. At its basest function, Quora allows people to ask questions and have them answered by anyone in the wider community. However, unlike other answer sites, Quroa seeks to document the information gained through these online Q&As, and build up a knowledgebase that can be accessed quickly and easily by other people seeking the same or similar answers. This might sound similar to Wikipedia, another site that compiles information through collective editing. The difference is that Quora isn’t anonymous, and your name is attached to the contributions you make, allowing people to contact and follow you. It’s also more of a general interest site than an encyclopaedia, offering know-how and personal opinions alongside factual information. Furthermore, the answers given can be refined and developed through collaborative efforts by the community. If one person gives an answer, another can come along and suggest edits to it to make it more accurate or helpful. In this way, the communal knowledge is built up to create the best possible stock of information. There’s room for more than one answer too, in the cases where opinions differ or alternatives can be offered. Because the answers become so detailed and informative, it’s like reading blog posts on a range of different topics. You can track the topics that most interest you, and peruse the questions and answers that are being added to it constantly. 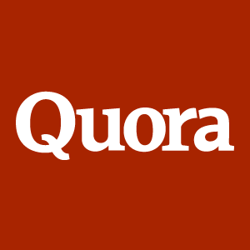 So why should you use Quora? For readers, it provides a wealth of quality, reliable information on pretty much any topic you can think of. For writers, it creates an opportunity to share your specialised knowledge and even add to it, and get people interested in reading more of what you have to say.